Blogs from the bank: Carp and Coarse fishing: Could do better? The opportunity to fish for four consecutive days presented itself to me this week along with the conundrum of where to go - given that a great number of my favourite lakes and the River Stour are inaccessible and even unsafe due to the recent flooding. I opted in the end for 2 ticket waters and 2 days on one of my club's lakes. My first day ticket was Mansfield Farm Lake. I had never been there before and had heard mixed reports but apparently there is a good head of carp (though the sizes of which are hotly disputed), crucians, tench, silvers and even sturgeon. The variety of species got me quite excited. I decided to target the carp with one rod fishing ledgered meat and on the other rod I float fished maggots and corn alternately for whatever might come my way. Throughout the day I had about 20 small roach on maggots and nothing on corn. I had a good run on the ledgered meat and connected with what felt like a carp briefly before the line went slack. The weather was better than forecast and so with the sun beating down on my corner of the lake in the late afternoon I decided to throw a few mixers out to see if anything would surface. Nothing happened at first but just as the light started to fade and the bait had washed up against the bank came that all familiar slurping sound. I was straight on it with a freelined mixer and managed to winkle one small carp out before the light had gone completely. I am disappointed not to have caught any of the other species that reside in this lake. I am in two minds about the place but will return in warmer weather to see if I can improve in this regard. Next was Longshaw Farm, not my first visit - in fact before I joined CDAA I was here all the time. My last trip to Longshaw was in November 2010 when all my clubs lakes had lids on them as did most lakes in the area but Longshaw is largely immune to ice thanks its water pumps. On that day I had 2 fish, an 8lb common and a 17lb 8oz Mirror. 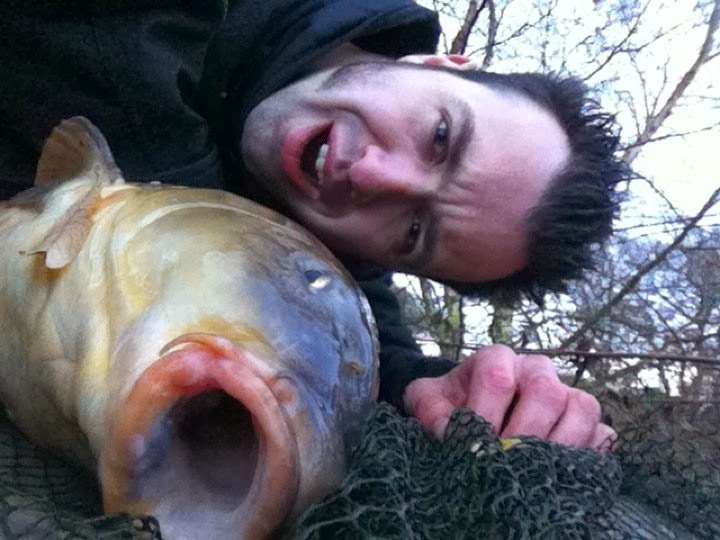 I was fortunate enough to have forgotten my camera that day - I say fortunate as forgetting my camera forced me to do what can only be described as a 'selfie' with my phone and produced my favourite of all my angling photos. It was no where near as cold this time, although there was a very chilly breeze rushing through the valley. When I set up on the big lake I was the only one there, a contrast to the middle lake next door where a match was being held. I've never fished a match, nor do I ever intend to - as the composer Bartok said 'Competitions are for horses not artists' and though I've not exactly got my angling down to an art yet, I am trying! It amused me to watch the exodus of anglers pushing their barrows to their swims at 9am and the simultaneous shuffle of their poles when the starting whistle sounded thirty minutes later. The swim I chose gave me access to a causeway between two reed beds within which there were plenty of carp nosing around evident by the reeds constant twitching. I cast one rod inside this channel and the other to the right, both sporting chunks of meat in front of an in-line lead. I spent much of Friday in this position. Birch Lake was my next stop. I arrived at 8:30am on Thursday and was the only person at the Littlebourne complex. Half an hour later my friend arrived and we set up opposite each other so that we could both fish the end of the lake towards which the wind was blowing. It was very cold and, having only just returned to normal levels after flooding, the water was a horrible chocolately brown. This time last year I fished here and had considerable success which I wrote about here. Therefore I could be forgiven for anticipating more of the same from this session. A morning of showers extended well into the afternoon and no bites were forthcoming. The weather improved later in the day but my catch rate did not. I snoozed until midnight when I discovered that my feet became warmer with just one pair of socks than they had been with two! With toasty toes I would have been able to sleep right through until morning if it hadn't been for a rude awakening from my bite alarm at 3:40am which kept up its jazz-like phrasing, disjointed and irregular, until I arrived at my rods and then stopped. This was all the excitement I was going to get within this 36 hour session. I tried meat, pellet wrapped in paste, bread (boilies are not allowed at this venue or infact any of the venues I visited this week) but nothing provoked any interest from the fish. My friend had no joy either. As I moved off several white vans were coming down the path bringing the next batch of anglers to try and conquer what is normally not a difficult water but one that on this occasion left me absolutely stumped. So as I reflect on the last four days I feel like the tranquility has done me some good but am slightly baffled as to how I could have disturbed the peace with a few more fish but, I suppose, that's what will spur me on to try again. It's not a sport of certainties but certain possibilities. That's why I love it so much. The sun setting in the field behind Birch Lake.